Amazing Fact…it takes 70,000 crocus to make one pound of saffron! The best saffron in the world, painstakingly plucked from the strikingly beautiful crocus bulb, Crocus sativus, is grown on the La Mancha Plateau, south of Madrid, Spain. This has been done historically on small family plots in villages throughout this area. As recently as 25 years ago, 80% of all the saffron in the world was grown in the surrounding villages. Today that number is around 5% as countries such as Iran, now with 90% of the market with much cheaper labor, have captured most of the world market forcing many of these rural families off their land. Fortunately, there is a renewed interest in the food world to preserve the authentic saffron of this area of Spain. Unfortunately, much of what is grown in the Middle East and Asia is shipped back to Spain, packaged and labeled as “Product of Spain” to take advantage of the historic reputation and the higher price for saffron from this country of origin on the world market. Caveat Emptor! Thus enters my dear friend and saffron ‘mentor,’ Buddy Born. I met Buddy in 1984 when we owned our restaurant in the San Francisco Bay Area. I knew so little about saffron at the time, (I thought is was just for turning food yellow!) and when he opened his sample, I was immediately engulfed with a pungent and aromatic smell like I had never experienced before. Each bright red thread was perfect and unbroken. Buddy explained to me the entire process of growing, harvesting, and delicately extracting the three stigmas from each crocus flower. He told me about the families who had welcomed him into their homes and allowed him to personally experience the harvest with them. This visit to Spain led him to become a direct importer so that the American market would have the opportunity to purchase and use this exotic spice that even then was a scarce commodity. The Saffron harvest begins mid-October and lasts for only a few weeks. Families arrive in the fields early morning and pick all the blooms that came up overnight. This assures that the flowers do not become dried out from sun and wind. The three stigmas of each crocus are then picked out of each flower by the petal-strippers who are known as mondadora, and immediately dried over an indirect heat source. The drying reduces the initial weight by 80%! This centuries-old ritual has remained virtually unchanged from generation-to-generation. The most common error in cooking with saffron is to add the threads directly to the dish being prepared resulting in a few blotches of yellow color but not the full, ‘distributed’ flavor. By simply infusing the spice in liquid for a minimum of 10 to 15 minutes in a process called ‘blooming,’ you release the full aroma and flavor of the saffron. Gently pour hot, but not boiling, liquid - water, wine, vinegar, milk, etc. - over the precious saffron and allow it to ‘steep’ as you would a cup of tea. KATZ Meyer Lemon And Saffron Risotto. Let us know if you have a favorite way to cook with saffron, as we would like to share it with our growing community of saffron lovers! 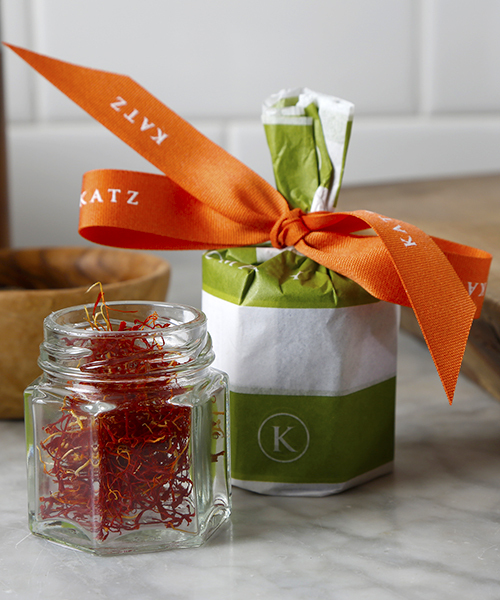 Saffron is called the “world’s most expensive spice.” We offer it in a traditional 1-gram jar. As with many coveted foods, you have to be careful as to what you are paying for. We offer 100% authentic Spanish Saffron, “La Mancha Select” (the highest grade available) that has been personally imported by our friend, Buddy Born, and we guarantee that each batch is the latest harvest available. Keep in cool, dark conditions out of direct sunlight. It is best used as fresh as possible.